This coming weekend is the Fourth Annual 48 Hour Book Challenge, in which bloggers read – and blog about – as many YA books as possible within a 48-hour period. For charity! Since we Active Voicers are strongly in favor of reading as much as possible and then yammering about it, and actually benefiting the world for once by doing so, we have decided to participate. What does that mean? Basically, from Friday through Sunday we’ll be reading all the YA we can get our hands on, sci-fi/fantasy or otherwise, and liveblogging about it here. We in turn will send all donations to Room to Read, a very excellent non-profit organization that operates in rural communities in Asia and Africa, building schools and libraries, publishing local language literature, and providing scholarships for girls’ education. These are all things that the Active Voice team feels pretty seriously down with! We’ll be posting more in this coming week with lists of books we plan to tackle over the weekend. Please feel free to recommend anything you think we should read and haven’t seen reviewed here. We can’t promise that we’ll be able to find/buy/read it, but we’ll do our best! Spread the word! And if you have any questions, or are participating in the 48 Hour Book Challenge yourself, let us know! For years, Beka has dreamed of becoming one of the Provost’s Dogs, the guards who keep law and order in the kingdom of Tortall. Now she has joined their ranks, but her talent for sniffing out conspiracies and going after the powerful criminals behind them may get her killed before she has a chance to enjoy it. 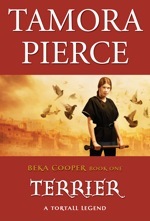 But Beka’s got one weapon no Rat can escape: she can hear the voices of the dead. Minli’s family is very poor, so Minli sets off to ask the Man in the Moon how her family can change their fortune. With her new friend, a dragon who cannot fly, Minli finds herself navigating the world of folklore. But will she know what to ask the Man in the Moon when she finally meets him?